About three years ago, we dug out the concrete sidewalk between the house and the driveway because it was poured a million years ago and was cracking and shifting everywhere….just not a very safe place to walk! After the sidewalk was out, we just left it. Not sure if we didn’t have the time, or didn’t have the money to fix it. Something tells me we just didn’t have the motivation. 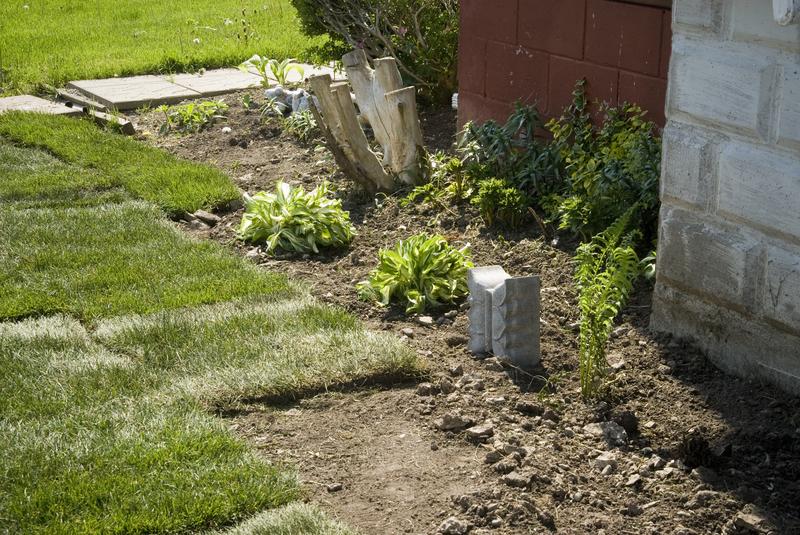 There really isn’t any grass here, just weeds and concrete! 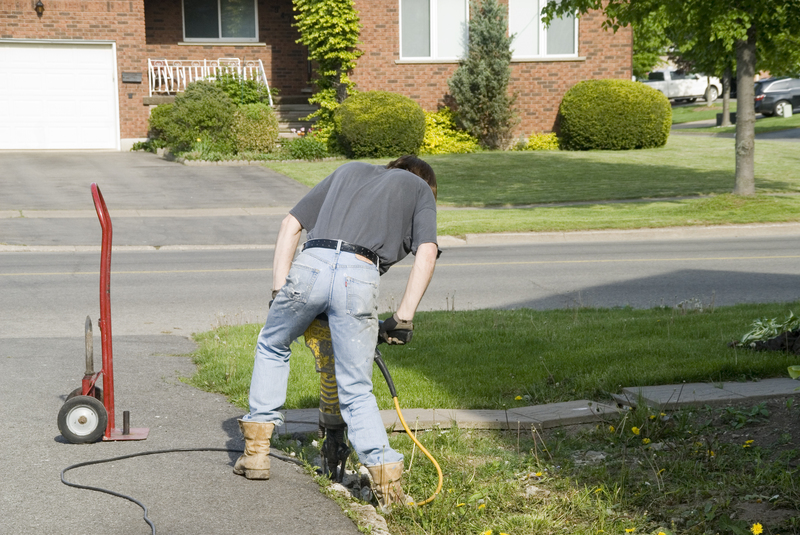 There were still little pieces of concrete that needed to come out, so we rented a jackhammer for the long weekend in May and just went at it! 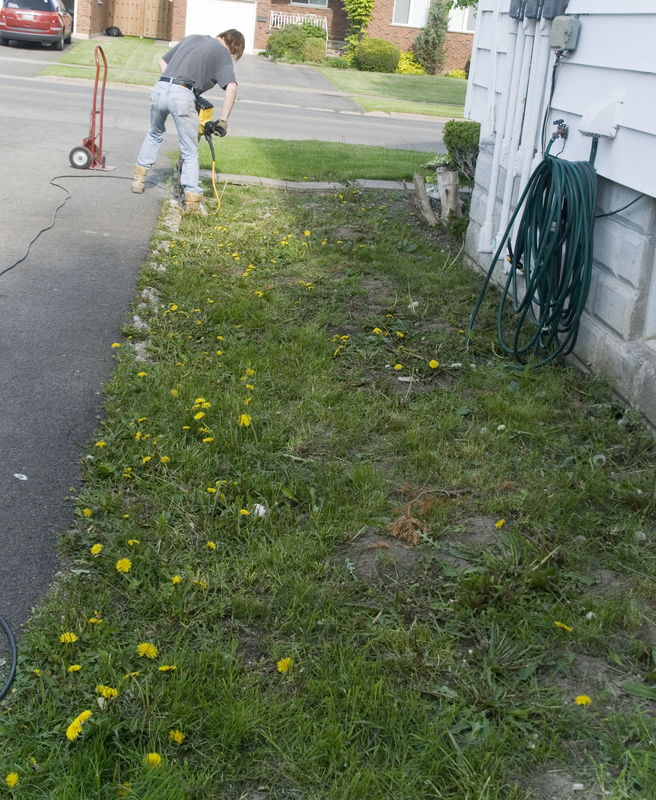 After the concrete pieces were out, Jack ran the rotor tiller through it a million times while I picked out the weeds. 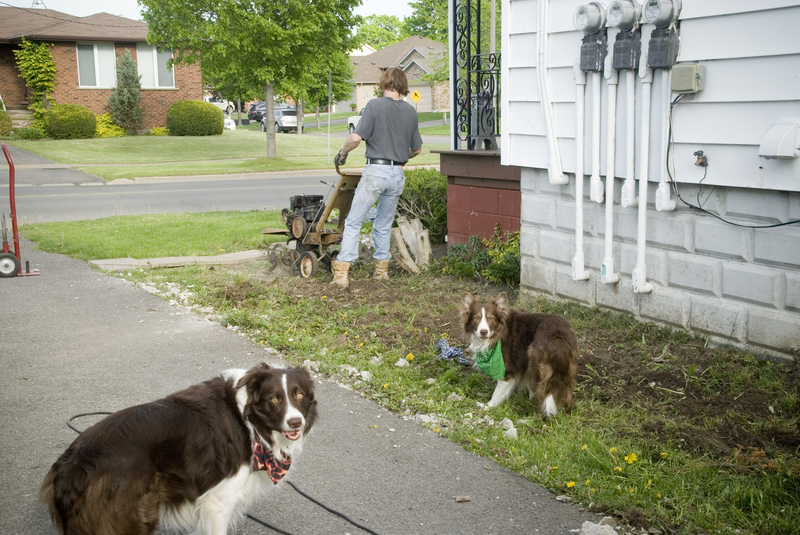 Border Collies like to help with EVERYTHING! Who knew, there was lots of dirt in there. Nice top soil. Whoa Hoo, that saved us the cost of a load of top soil! Look at that top soil! After we racked and racked the soil to perfectly level is along the driveway, we realized that we were going to come short on the soil. 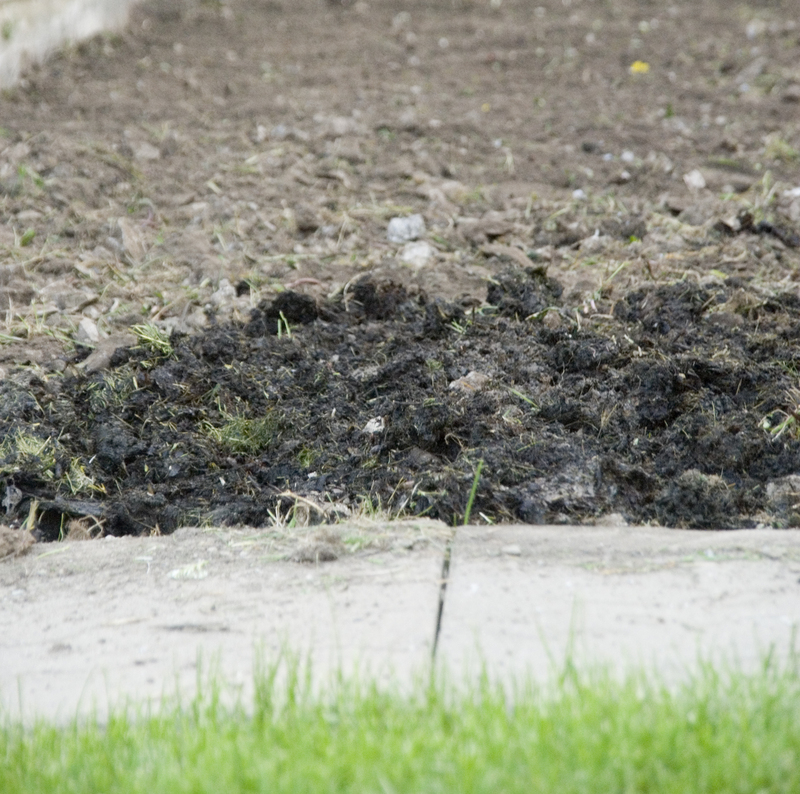 Since we have a pit in the side yard that we use for compost, we dug down deep and shoveled out some really, I mean really stinky “mud”. We put this in our veggie and herb garden every fall and let me tell you, the soil in those gardens is like a dream! 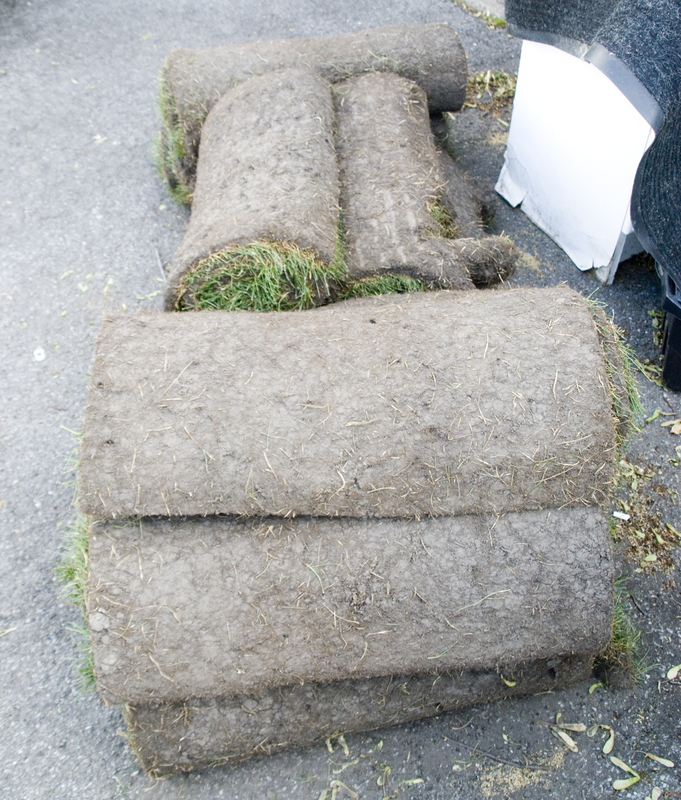 So we assumed that it would be good for sod as well. Not sure, only time will tell. Since we put the compost down, we have had a robin hanging around the side of the house. Maybe he can smell it too! 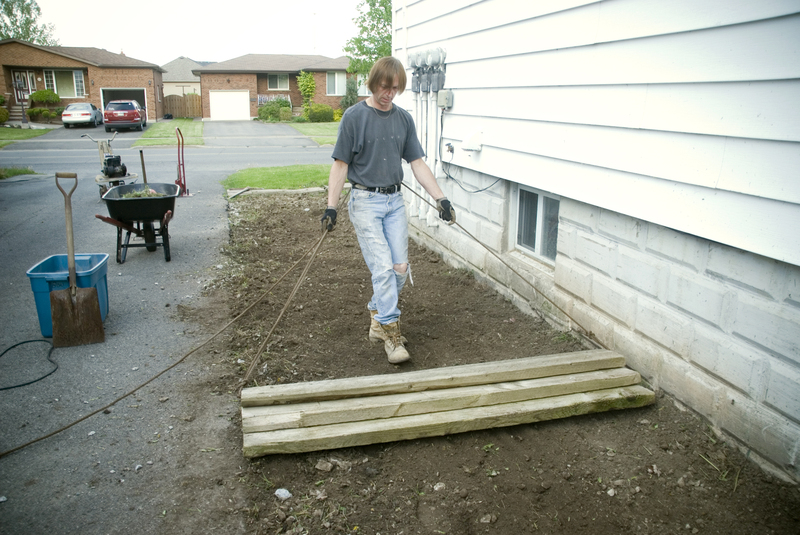 We found someone locally that was selling 11 pieces of sod that was left over from a project. Since we didn’t know how much footage 11 rolls would cover, we hoped it would cover the area and went to pick it up for a small fraction of what it would cost at the sod farm….more savings! Turns out 11 rolls just aren’t going to cover it. We need to go and pick up 4 more rolls. Not a big deal. Since I have no patience to try and make something look good, I decided not to wait until we got the new sod (keep in mind it was a long weekend and that meant waiting another 4 days….too long!) 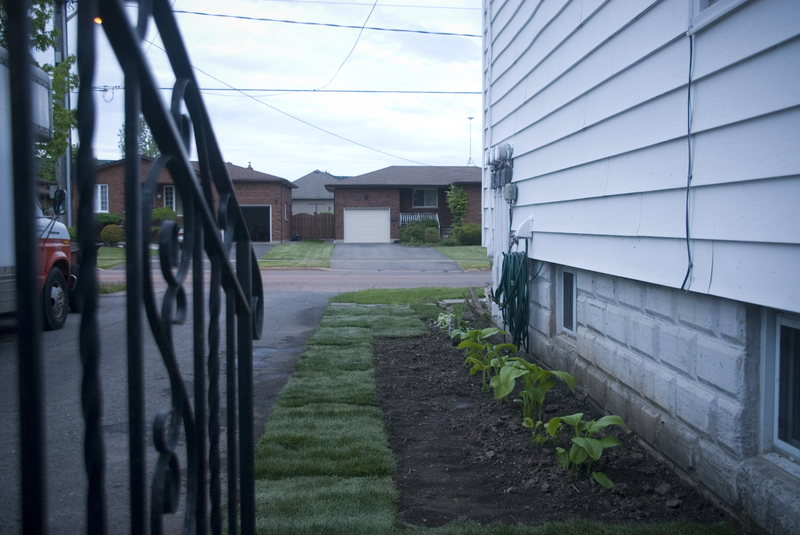 so I divided a HUGE hosta in the back yard and transplanted it along the side of the house. As the sun goes down….just made it! The next morning the sod was still green, so I assume that is a good sign. Neither Jack or I have ever laid sod, so we are keeping our fingers crossed. Trying to water two times a day. The sod and side porch garden in the a.m.
Next week we will be able to finalize the project. – Hope the sod survives!